Following directly on from Pressure School Part 1, where we discussed the benefits of in-cylinder pressure analysis with an engine cranking, we now move on to in-cylinder analysis with an engine running. Once again, paramount in any in-cylinder pressure analysis is the disconnection of the relevant fuel injector to prevent bore wash, oil contamination, and catalyst damage (or in the case of a diesel engine combustion taking place, resulting in: potential injury, damage to the compression hose, and damage to the transducer). With fuel removed from the cylinder in question, we are left with a simple air pump system where the air is drawn in via the intake, compressed, decompressed and then released via the exhaust (this is the four-stroke cycle). Each stage of the four-stroke cycle reveals characteristics about the efficiency of the cylinder and the timings of each stroke relevant to the degrees of crankshaft rotation. Such revelations allow for dynamic in-depth analysis of the four-stroke cycle for each cylinder, enabling technicians to pinpoint specific errors, such as timing chain elongation, worn camshaft lobes, poor alignment (or installation) of camshafts, broken and insecure rockers, compressed hydraulic lifters, or camshaft lobes that have spun independently of the camshaft. All of these conditions will adjust the independent valve timing of each cylinder. I have personally utilised this in-cylinder measurement technique on numerous occasions, to bring about a rapid conclusion to the most challenging of engine running issues. I would now like to take a look at a known good cylinder waveform from a petrol engine, running at idle speed. Like all diagnostic techniques, we need to know what the waveform from a good cylinder looks like before we begin to formulate theories about the capture we have taken from the engine under diagnosis. The waveforms below have additional features in comparison to the in-cylinder pressure waveform from a cranking engine. 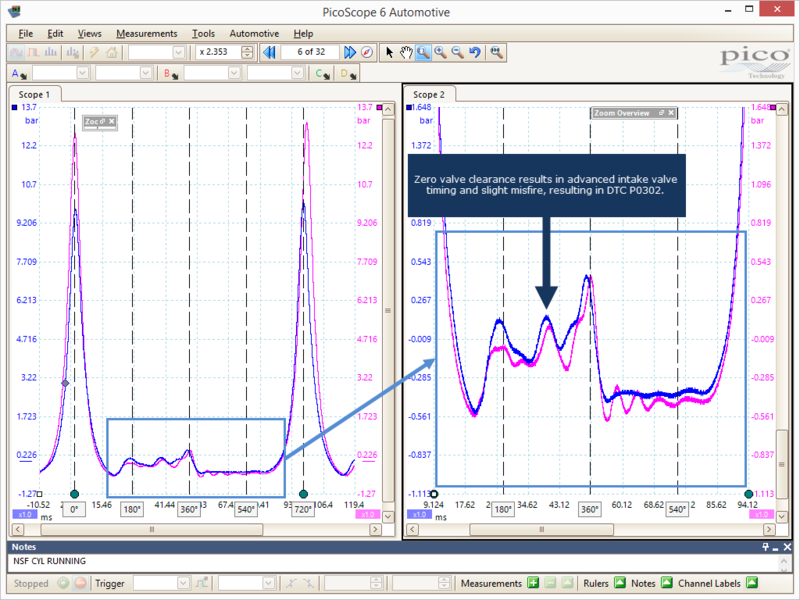 We can now detect and measure the intake and exhaust events based on the formation of the expansion and intake pockets. As a general rule of thumb, the expansion and intake pockets should be equal in depth, and measure the typical negative pressure found in the intake manifold at idle speed (approximately –650 to –750 mbar). In addition to the depth of the expansion pockets, their duration relates directly to the opening and closing of both the exhaust and intake valves. This time can be measured against crankshaft rotation by using the rotation rulers found in the PicoScope software. Do not forget that compression towers should be symmetrical and uniform in structure, with an equal build and decay in pressure (remember there is no combustion taking place inside the cylinder). Valve overlap activity can be monitored and measured for correct timing and duration in relation to crankshaft rotation. This is done during the transition of the piston at top dead centre (TDC) on the exhaust stroke, through to the commencement of the intake stroke. Valve timing and lift errors can be identified if the valve overlap events do not take place at the correct rotational position of the crankshaft. 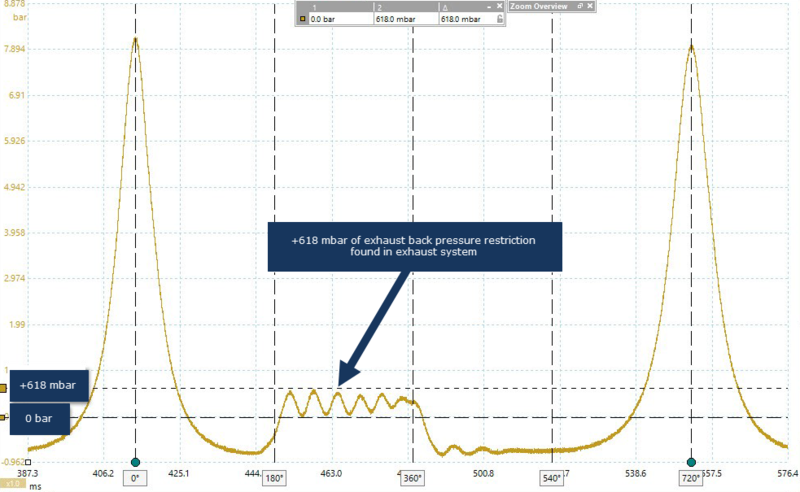 The waveform in Figure 3 confirms a retarded exhaust valve open event based on the oversized expansion pocket, as well as a momentarily retarded intake valve open event with minimal duration. Here we have a classic valve timing error on both camshafts, along with insufficient valve lift and duration of the intake valve. Restrictions present in the exhaust system can be rapidly confirmed, with the presence of backpressure measured inside the cylinder, when the piston ascends during the exhaust stroke. Here we can identify diesel particulate filter (DPF) and catalyst restrictions without intrusion to the exhaust system (exhaust valve open should result in cylinder pressure equalising to atmospheric pressure). The waveform in Figure 4 indicates over 600 mbar of backpressure at idle speed. This can only increase with engine speed and will result in power loss, and as a consequence, damage to relevant components. Often, in-cylinder waveforms require close analysis where errors are not apparent. The WPS500X pressure transducer has an ultra-fast response time of 100 microseconds, and when combined with the zoom and scaling features of PicoScope, even the smallest anomalies can be revealed (as with the waveform above). These features allow us to measure variations in individual cylinder valve timings, as a result of valve clearance errors, camshaft lobe wear, or valve lifter and rocker failure. You can see an example of this in the following case study. To conclude, the WPS500X pressure transducer has opened up a whole new world of diagnosis, enabling the technician to visualise in-cylinder events under various engine run conditions. However, the WPS500X Pressure Transducer is not limited to just in-cylinder analysis when it comes to engine evaluation and diagnosis. We can apply the pressure transducer to the intake manifold, exhaust tailpipe, lambda sensor aperture, or crankcase via the dipstick tube, to name just a few accessible locations. I believe we are just scratching the surface of this tool’s potential, and that it has become as essential to many diagnostic procedures as a current clamp.